Annals of Scotland, from the Accession of Malcolm III, in the Year MLVII to the Accession of the House of Stewart in the Year MCCCLXXI. - Sir David Dalrymple of Hailes, Bart. 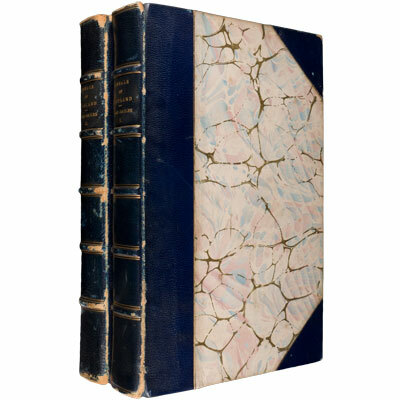 1819 - Archibald Constable & Co. and Fairbairn & Anderson., Edinburgh - Third Edition	Two volumes, encompassing Dalrymple’s greatest work, the third volume, which comprised of Dalrymple’s other historical writings is not included. ‘Lord Hailes's most important contribution to literature was the Annals of Scotland, of which the first volume, From the accession of Malcolm III, surnamed Canmore, to the accession of Robert I, appeared in 1776, and the second, From the accession of Robert I, surnamed Bruce, to the accession of the house of Stewart, in 1779. It is, as his friend Dr Johnson justly described this work at the time of its appearance, a ‘Dictionary" of carefully sifted facts, which tells all that is wanted and all that is known, but without any laboured splendour of language or affected subtlety of conjecture’.’	Sir David Dalrymple, 3rd Baronet, Lord Hailes (October 28, 1726 – November 29, 1792) was a celebrated Scottish advocate, judge and historian, born in Edinburgh. He was educated at Eton, and studied law at Utrecht. In 1748 upon his return to Scotland from Utrecht he was admitted an Advocate. It is said that as a pleader he attained neither high distinction nor very extensive practice, but he rapidly established a well-deserved reputation for sound knowledge, unwearied application and strict probity, and in 1766 he was elevated to the bench in the Court of Session where he assumed the title of Lord Hailes. Ten years later he was appointed a Lord of Justiciary. Provenance: Professor David Fyfe Anderson (1904-88), Scottish surgeon, with his name dated 1949 to front free endpapers.